Hand-to-hand fighting briefly broke out in the nationalist Short Strand enclave on Friday night on the eve of a commemoration in the area of the Battle of St Matthew’s. On June 27 1970, Republicans defended St Matthew’s Catholic church and the Short Strand from a loyalist mob. The gun battle lasted five hours end left two Protestant men and one Catholic men dead. On Friday night, loyalists holding a parade to commemorate the event entered the a small nationalist enclave in the predominantly Protestant east Belfast. A confrontation with local nationalists quickly flared into fighting on the Mountpottinger Road, but ended as the loyalists withdrew. On Saturday, Sinn Fein President Gerry Adams unveiled a memorial garden to mark the fortieth anniversary of the famous gun battle. There was also a wreath-laying ceremony and short parade to the garden by relatives of the dead and injured. In his speech at the memorial garden, Mr Adams said that the Short Strand had a long history of oppression and resistance. “The people of the Short Strand endured much hardship at the hands of the unionist regime,” he said. “Today we remember that historic night 40 years ago when the people of this parish arose in defiance of the failed Orange state and its sectarian mobs. He said commemorating such watershed moments in history provided “an opportunity to open up a dialogue about the future shape and direction of this island”. “Unionists have a different view of these events. And that’s fine,” he said. “After decades of war we each share powerful emotions of hurt and pain. “Republicans are very mindful, even as we remember our patriot dead, of the hurt we have inflicted on others. “I have expressed my regret at that in the past and I do so again here today. “Republicans are focused on healing the hurt of the past and we are looking to the future. 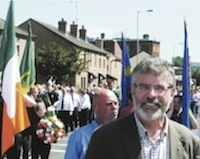 Meanwhile, the annual Whiterock parade passed off quietly at the weekend. The Orange Order march in west Belfast has been the scene of violent confrontations in previous years. Dozens of loyalist bands took part in the march on Saturday during which the ‘peaceline’ gates at Workman Avenue were opened to allow one lodge to symbolically march on the overwhelmingly nationalist Springfield Road. Republicans held a silent protest watched over by a heavy PSNI presence. PSNI Chief Superintendent Mark Hamilton afterwards expressed his “appreciation” to those who marshalled the parade and the protest. “Both sides showed great leadership in ensuring that this event could pass off without disorder or major disruption to the community. Portadown Orangemen have also finally informed the Parades Commission of their intention to hold the lodge’s annual Drumcree march in Portadown on July 4. Earlier this month, the Orangemen appeared to be intending to stage an illegal parade, escalating tensions ahead of the annual stand-off. Since 1998 the Portadown lodge has applied weekly to march along the mainly nationalist Garvaghy Road and has been refused permission. Intense and widespread violence broke out in the late 1990s over attempts to force the provocative parade through the nationalist Garvaghy Road enclave. Members gave the form to the police on Drumcree Hill yesterday afternoon although it should have been lodged with the Parades Commission by June 6.